Expression of hTAU-P301L induces rapid pathological hyperphosphorylation, conformational changes, and aggregation of TAU in transgenic zebrafish. (A) Double whole-mount immunostainings for phosphorylated and total TAU of 32-hour-old transgenic zebrafish embryos expressing hTAU-P301L and DsRed. 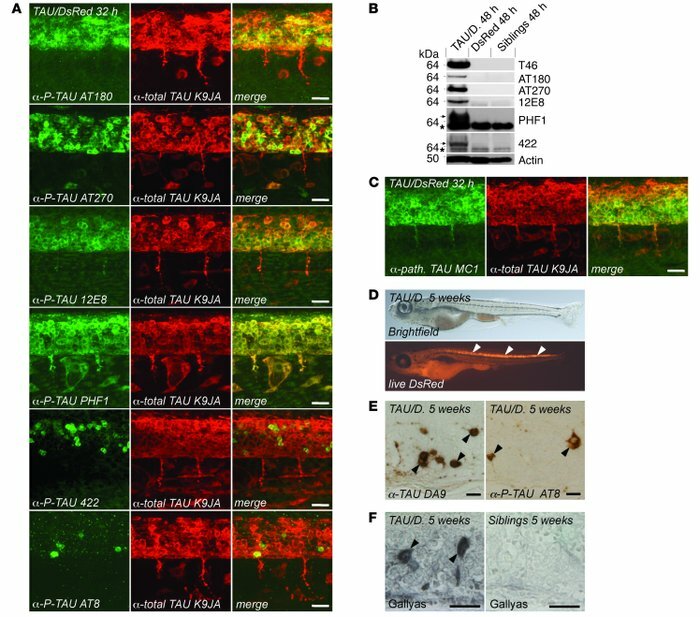 TAU is phosphorylated in spinal cord neurons at residues Thr231/Ser235 (AT180), Thr181 (AT270), Ser262/Ser356 (12E8), Ser396/Ser404 (PHF1), Ser422 (422), and Ser202/Thr205 (AT8). (B) WBs of total and phosphorylated TAU of 48-hour-old transgenic zebrafish embryos expressing hTAU-P301L and DsRed or DsRed alone or nontransgenic siblings. Phosphorylated TAU is only detected in TAU/DsRed transgenic embryos. No cross-reacting bands are detectable in controls at the same molecular weight. In addition to the specific band above 64 kDa (arrow) in TAU-positive embryos, antibodies PHF1 and 422 detect a nonspecific band at lower molecular weight in all embryos (asterisk). (C) TAU changes its conformation to a pathologic state, as shown in whole-mount immunostainings, by using the conformation-specific antibody MC1, in most neurons of 32-hour-old embryos expressing the TAU transgene. (D) Side views of 5-week-old living zebrafish in bright field and DsRed illumination. The fish are still rather translucent, and the transgene-expressing cells can be detected by their red fluorescence (arrowheads). (E) Immunohistochemical stainings of spinal cord paraffin sections of the same 5-week-old TAU transgenic zebrafish for total TAU (antibody DA9) and pathologically phosphorylated TAU (AT8) (arrowheads). (F) In addition, tangles are observed by Gallyas silver staining in sections of the same 5-week-old TAU transgenic zebrafish (arrowheads). Scale bars: 20 μm.